Keith Kizer, executive director of the Nevada State Athletic Commission, on Tuesday revealed to MMAWeekly.com that Top 10 ranked UFC fighter Karo Parisyan has tested positive for Hydrocodone, Hydromorphone, and Oxymorphone following his UFC 94 split decision victory over Dong Hyun Kim. All three substances are known for their pain relieving qualities. 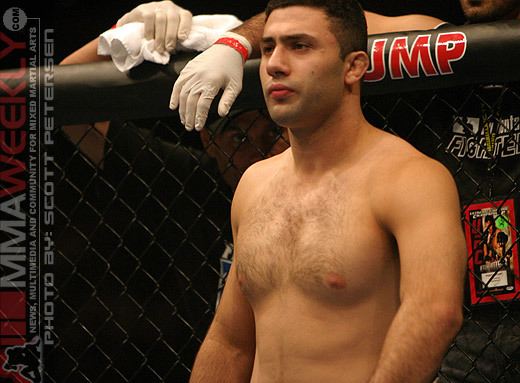 When contacted by MMAWeekly.com about the positive test result, a surprised Parisyan said that he revealed all medications that he has been taking prior to UFC 94 as required. He believed that he had followed proper procedure and was not in violation of any rules. Parisyan has had much to deal with outside of the ring lately. He withdrew from a UFC 88 bout with Yoshiyuki Yoshida, due to a reported last-minute back injury. But aside from that, the Armenian has had a history of dealing with panic attacks, for which he has taken prescribed medication. Now he faces the charges of the use of banned substances, which puts in jeopardy what he believed to be his next fight. Parisyan says that he was under the impression that if Josh Koscheck were to win his fight against Paulo Thiago at UFC 95 in London, he would fight Koscheck at UFC 98 at the end of May. Though Parisyan will have his chance to address the charges before the NSAC, James Irvin, who also tested positive for Oxymorphone, as well as Methadone, was suspended for nine months for his infractions.